We’d love your help. Let us know what’s wrong with this preview of Keep a Little Secret by Dorothy Garlock. The new novel from the New York Times bestselling author follows Charlotte Tucker, the young girl from Garlock's most recent novel, Stay A Little Longer, into adulthood. As a child, Charlotte Tucker was raised in small town Minnesota where the only real company was the people who came to her aunt Louise's boarding house. Several years later, Charlotte is a young woman and The new novel from the New York Times bestselling author follows Charlotte Tucker, the young girl from Garlock's most recent novel, Stay A Little Longer, into adulthood. To ask other readers questions about Keep a Little Secret, please sign up. I can't remember why I picked this up. It was okay. There was a tornado. I"m slowing making my way thru Dorothy Garlocks books. while reading it, I could tell that there was a prequel & a sequel involved. I had to look it up to see if it was a series. It was the 2nd book in the series. since i didn't know, i honestly didn't feel lost b/c i hadn't read them. She did a good job of summing up the previous story in a paragraph or two. I didn't find the romance b/w Owen & Charlotte as interesting as the 2 subplots. I was busy trying to figure out who the saboteur was & also interested in the pregnant teen girl. I liked this book. I gave 3 stars because of how it abruptly ended. The slow romance between the main characters was sweet and fit the era of the book. The secrets they all kept were entwined in most of the characters. Each touched the other. As love also gathers them together to form a new family. Barbara, my volunteer at the Pantry, loaned me this book. It is a good reminder of why I don't like most romances. I managed to work my way through the whole thing, feeling the disappointment of wasted time at the end. The plot was predictable and contrived. I do not like the push-pull of most romances and this one is classic. Wow. It's bad. But it's bad in the way that you need something to read that asks nothing of you, including remembering a plot line or characters. You can put it down for a few days and come back when you have a minute or an hour, and that's what I need at the moment. So does that make it good? This is the newest offering from a NY Times Bestselling author who has written almost fifty books offering mystery, seduction, and the most beautiful romances to be put on paper since Jane Austen unleashed her talent on the world. So it comes as no surprise that this latest story by Ms. Garlock was a "must-read" from page one. Readers begin briefly in Colorado in the year 1938 sitting by the side of a woman who has lived a life full of happiness and joy, yet has kept a secret buried deep inside This is the newest offering from a NY Times Bestselling author who has written almost fifty books offering mystery, seduction, and the most beautiful romances to be put on paper since Jane Austen unleashed her talent on the world. So it comes as no surprise that this latest story by Ms. Garlock was a "must-read" from page one. Readers begin briefly in Colorado in the year 1938 sitting by the side of a woman who has lived a life full of happiness and joy, yet has kept a secret buried deep inside her heart. Once upon a time this woman became impregnated by a man whose identity she has never revealed to her twins - Owen and Hannah. Now that she is at the end of her days her son, Owen, wants nothing more than to find out the name of the man who left his mother with two children to raise, no financial help, and a stigma attached to her that made the townspeople have nothing to do with her because she was an unmarried woman. When she passes on, Owen goes to work overturning the house and rifling through his mother's things in order to find out the identity of this man who he's going to find...and destroy. In 1939, Charlotte Tucker is a young woman who is just about to set out for her new life. She’s been stuck in her small town life, but has just received a letter asking her to become the schoolteacher in Sawyer, Oklahoma. She can barely contain her excitement as she boards a train and leaves the "green, lush world" behind and travels for miles staring out the window and watching the mighty oaks and elms turn into tumbleweeds, and the green grass turn to shades of red and brown in the dry, hot landscape. When she's met by John Grant, Charlotte is even more excited. While in Sawyer she'll be boarding with John and his wife on a huge horse ranch that looks like a mansion oasis in the clouds of bright red dust that swirl around her. John is a lovely man and wants nothing more from her than to do him a favor - offer an education to a young girl who is pregnant with child whose man is no longer by her side. When Charlotte attends her first dinner at the ranch, surrounded by the many hired hands that work on John's ranch, she meets a wonderfully kind, HUGE man by the name of Hale. Hale McCoy is one of those lions with the heart of a lamb who is head over heels for another young woman who has recently come to town - Hannah Williams. Hannah works at the local barrister's office and she and her brother, Owen, reached Sawyer just a short time before Charlotte arrived. When Charlotte first stares into the eyes of Hannah's surly brother, she is struck by the fact that she's absolutely and completely attracted to him. Even as time goes on and Owen decides to call her Charlie, and be short and abrupt with her at every turn, Charlotte can feel something hidden behind the mask of anger he shows to the rest of the world. As secrets are uncovered and Charlotte begins to understand the issues that are at stake on Mr. Grant's ranch, she finds herself falling deeply in love with Owen - but wanting to defend her employer against the allegations that Owen truly believes. Owen knows in his heart that John Grant is the man who long ago hurt his mother and will do anything to make sure that the man - and all he's worked for - is destroyed. Add in a slime by the name of Carter Herrick, who also holds a secret that will alter Owen's world, and strange, funny characters like the owner of the local funeral home who does nothing but stop people in the street to talk about their future deaths, and this book has something for every reader of every genre. Ms. Garlock has once again proven that she knows exactly what to write, and this story is one that you won't want to put down. The romance between Owen and Charlotte; the courtship of Hannah and the large Hale McCoy; the back story of the villain Carter Herrick; and the debts that have to be paid by many all come together to make sure that the action in this novel never stops. Enjoy! This review has been hidden because it contains spoilers. To view it, click here. I liked the book well enough. I would like to read Stay a Little Longer which is about Charlotte's Father and Aunt/Stepmother and the follow up book Come a Little Closer which is about Charlotte's half sister Christina. Plot - The story was good but there were a few things that just didn't sit right w I liked the book well enough. I would like to read Stay a Little Longer which is about Charlotte's Father and Aunt/Stepmother and the follow up book Come a Little Closer which is about Charlotte's half sister Christina. Charlotte left her home behind to come teach in Sawyer, Oklahoma. She is put up at a ranch near town owned by John Grant. While living on the ranch she meets Owen and Hannah who have come to Sawyer to get revenge on their father, who left their mother while she was pregnant. Strange accidents then start happening at the ranch, and people's lives get put in danger. It seems like everyone suspects Owen. Charlotte begins to realize her feelings towards him and becomes determined to clear his name, Charlotte left her home behind to come teach in Sawyer, Oklahoma. She is put up at a ranch near town owned by John Grant. While living on the ranch she meets Owen and Hannah who have come to Sawyer to get revenge on their father, who left their mother while she was pregnant. The story is pretty solid, and I enjoyed the character of Charlotte. She seemed kind and helpful, but also knew when things weren't right and would try and get things sorted out. Owen was ok, but really angry. Some of it I could understand given the circumstances, but I think his anger could almost be a bit scary at time. Hale is sweet! I thought he was so loveable. The author obviously has quite some knowledge of ranch life and describes it well. It reminds me of when I heard my grandparents talk about what life was like on the farms they lived on in their youth. I really enjoyed being immersed in the story and lifestyle of the characters. Overall, this was a quick read, and an enjoyable one. I would recommend it for people who like romances. I received this book for free through Goodreads First Reads. Thank you! I nabbed this book off the "New Books" section of the library since the teaser looked great, but I'd never heard of the author, and I'm always a little wary of secular romance, so I ventured into it skeptically. And a chapter or two in, I discovered that this is actually the second in a series. I dutifully stopped to research the first... but after reading about that one decided it wasn't even worth it and broke my own rule, jumping into the series. To Ms. Garlock's credit, I did actually enjoy t I nabbed this book off the "New Books" section of the library since the teaser looked great, but I'd never heard of the author, and I'm always a little wary of secular romance, so I ventured into it skeptically. And a chapter or two in, I discovered that this is actually the second in a series. I dutifully stopped to research the first... but after reading about that one decided it wasn't even worth it and broke my own rule, jumping into the series. To Ms. Garlock's credit, I did actually enjoy the first half of the book. It was simple, a bit shallow and pieced together, but a mildly amusing story, nonetheless. Then came the scene I was waiting for, the one that had to get sexually explicit. Seriously, though, I wouldn't have minded it at all if it actually had added something to the story! Alas, it was thrown in like a last ditch effort to impress or entice the reader, since the rushed and convoluted plot didn't seem to be getting the job done! I'm all for some passion in a story, but it has to further the story in at least some small way, and be tastefully done. I've read a few other books by Ms. Garlock, and this historical romance novel was a treat, with strong characters and Ms. Garlock's old-fashioned, no-nonsense storytelling. It is 1939. The Depression is finally ending and everyone faces new challenges with renewed can-do-spirit. Charlotte Tucker is no exception. She has always followed her heart, and now it leads her to Oklahoma's biggest ranch where she can teach in her very own schoolhouse. When suspicious accidents put the ranch and lives in j I've read a few other books by Ms. Garlock, and this historical romance novel was a treat, with strong characters and Ms. Garlock's old-fashioned, no-nonsense storytelling. When suspicious accidents put the ranch and lives in jeopardy, Charlotte believes in the one man, Owen Wallace, no one else trusts and asks him to help her uncover the truth. There's bad blood between the ranch owner and Owen, but Owen is as brave as he is caring, risking even his own dangerous secret to keep Charlotte safe. With a tornado and a vengeful enemy fast closing in, Charlotte and Owen must muster every ounce of courage to make things right, and claim their dreams together. This book is part of my personal library, and I enjoyed it enough to award it 4 stars. 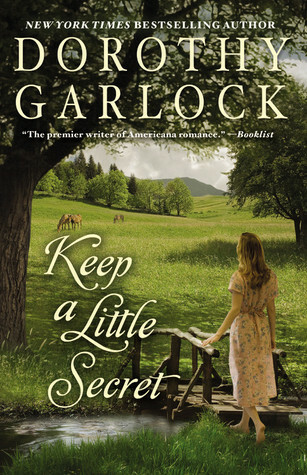 Keep A Little Secret by Dorothy Garlock is about secrets, revenge and romance. Charlotte leaves her home in Minnesota to teach in Oklahoma and lives on John Grant’s ranch. John Grant is a target of two people holding grudges against him.Owen and his twin sister leave Colorado in search of their father to get revenge but find love instead. There are several calamities that make this an interesting read. I was attracted to the cover and when I saw it was by Dorothy Garlock, I had to get it. This is Keep A Little Secret by Dorothy Garlock is about secrets, revenge and romance. Charlotte leaves her home in Minnesota to teach in Oklahoma and lives on John Grant’s ranch. John Grant is a target of two people holding grudges against him.Owen and his twin sister leave Colorado in search of their father to get revenge but find love instead. There are several calamities that make this an interesting read. I think the author raced to the end and missed a great opportunity. Imagine a young girl giving birth in a shelter filled with twenty or so ranch hands stuck close by while a tornado rages above. She and the baby would have protectors for the rest of their lives. Now about what the author actually wrote, it felt authentic but there were too many loose ends. I wanted to see the old bat of a school teacher retire. It is too bad when an author creates such real characters and doesn't make the most I think the author raced to the end and missed a great opportunity. Imagine a young girl giving birth in a shelter filled with twenty or so ranch hands stuck close by while a tornado rages above. She and the baby would have protectors for the rest of their lives. This story was ok, nothing spectacular but a decent read to pass the time with. The romance was kinda bland and the suspense on the "who done it" part wasn't very suspenseful. You're told half of who the bad people are pretty early in the story and its pretty easy to figure out who the other one was so really no big suprises in the story at all. All in all, if your looking for some steamy romance or a lot of suspense and intrigue this isn't your book; but if you are looking for a light read with This story was ok, nothing spectacular but a decent read to pass the time with. The romance was kinda bland and the suspense on the "who done it" part wasn't very suspenseful. You're told half of who the bad people are pretty early in the story and its pretty easy to figure out who the other one was so really no big suprises in the story at all. I found this book in a bargain bin at Barnes and Noble and I was pleasantly surprised. I didn't feel like there was amazing chemistry with the couple but it was a sweet story nonetheless. There was also a lot of unfortunate events that kept my interest and though I had an idea who was behind it, I still enjoyed the mystery. I looked into other books by this author and saw she has a lot to choose from so I will definitely try other stuff from her. Up to this point I've really liked every Dorothy Garlock book I've read. But this book had surprisingly little to it. Charlotte relocates to Oklahoma to be the new school teacher. She meets Owen and Hannah who have relocated to Oklahoma to try to find their biological Father. Suspicious things start happening on the ranch they are all staying at. The group gets themselves into some sticky predicaments. There's not a lot more to it, it was really disappointing. The base of the story - twin brother and sister out looking for their biological father in the era before DNA testing was available was interesting. I felt like the romance part was lukewarm - I didn't really see where the attraction for Owen came from. I don't think an independent and adventerous woman, such as Charlotte, would fall for a bad-tempered guy like that. This is another of Garlock's stories set in the late 1930's, early 1940's. Charlotte Tucker leaves Minnesota to go to Rawlings, Oklahoma to teach school. There she encounters twins, Hannah and Owen Wallace, who are on a secret quest to find the man who "ruined" their mother. Garlock is not just a writer, but a very good story teller. Her writing is reminiscent of an earlier, innocent time. A nice and warm story. Dorothy Garlock books never disappoint me. But there are quite a few parts in this book that weren't well explained and I definitely didn't like the way how Carter died. His character seemed to be made up just for the sake of having a bad guy in this story. A redundant character. There's really not a whole lot to this novel. Even the "secrets," promised in the title, are easily figured out well before Garlock reveals them to us. Everything is so predictable, and even the writing is very elementary. I felt like I was watching a daytime movie on Lifetime. I can see how someone would enjoy this as a quick beach read, but it just wasn't for me. This is a fast-paced romance, set in the late 1930's -- a wonderful cast of characters in a small town that experience everything from a new roller rink to a tornado. There are two romances in the story -- a brother and sister both find their true loves. Revenge is the central theme of the book and it is skillfully woven into the story. I was a couple of chapters into this book when I realized it was the 2nd book in a set. I debated waiting to read it until I could read the 1st book but I really didn't want to wait as I was quite interested in the characters. There were a couple of references to things that happened in the 1st book but I still thoroughly enjoyed it. I would enjoy reading more books about these characters. Dorothy Garlock is always enjoyable, and that is why I decided to read this book. This one was just okay, not great, and certainly not as good as Come a Little Closer. It was a good story when I could get past some of the Harlequin romance-type language. I almost got a sugar high reading parts of it. This was not Garlock's best, but I wouldn't give up on her entirely. Dorothy Garlock was a best-selling American author of over 60 historical romance novels, most of them set in the American West. More than 20 million copies of her books are in print, in 18 languages. Her books have been on the New York Times best seller list seven times. She was named one of the 10 most popular writers of women's fiction four years in a row, from 1985-1988. In 1997, she was awarde Dorothy Garlock was a best-selling American author of over 60 historical romance novels, most of them set in the American West. More than 20 million copies of her books are in print, in 18 languages. Her books have been on the New York Times best seller list seven times. She was named one of the 10 most popular writers of women's fiction four years in a row, from 1985-1988. In 1997, she was awarded the Romantic Times Lifetime Achievement Award. Garlock is also a member of the Romance Writers Hall of Fame.